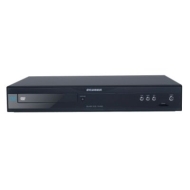 alaTest a collecté et analysé 13 avis de consommateurs et d'experts pour le produit Sylvania NB530SLX Blu-ray Disc Player (Black). La note moyenne du produit est 3.9 sur 5, tandis que les autres produits de même catégorie ont une note moyenne de 4.0 sur 5. Après analyse des notes de consommateurs et d'experts, de l'âge du produit ainsi que d'autres facteurs, et comparé aux autres produits de même catégorie, le Sylvania NB530SLX Blu-ray Disc Player (Black) obtient un alaScore™ de 72/100 = Bien. Would buy it again and recommend it. The first time we watched a Blu-Ray on this Sylvania Blu-Ray player, we were impressed. But what really caught our attention the second time we watched the same movie was that the Blu-Ray player recognized the movie! I received my Blue-ray player and watched both Blue-ray and DVD's right away without issues. Great price. No need to pay more. The Sylvania Blu-ray player's has amazingly sharp, vivid color. I was looking to get a backup or main standalone BD player to take the heat off of my PS3 so when I saw that Amazon had this one on sale for $59.99 I figured I would bite. I am not very knowledgable about technical things, and I don't have a lot of money. This player was very reasonable priced, and easy to hook up to my TV. I have had it for about a year, and have had no problems.